Madame Nhu is in a small split-level space in Surry Hills which chef/owner Nhu Nguyen designed herself and calls “a work of love”. 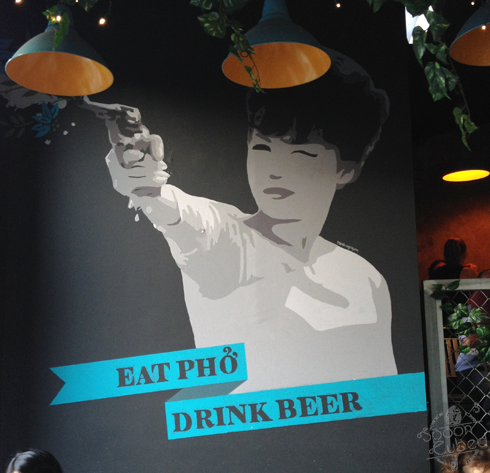 A mural emblazoned with the phrase “eat phở, drink beer” decorates the outer dining room and was painted by Nhu’s husband Minh (who is also the chef at Xage). I want it on my own wall, especially the part where it’s telling me to eat and drink. The bright blue shutters and bare brick walls give the room a look reminiscent of French architecture in Vietnam. As I’m reading through the plastic menu, I come across this: “The taste is revolutionary!” – Uncle Ho and I start laughing because it’s hilarious to me. Wooden chopsticks and spoons are placed in empty metal tea cans, exactly like the ones I used to see in my auntie’s cupboards. 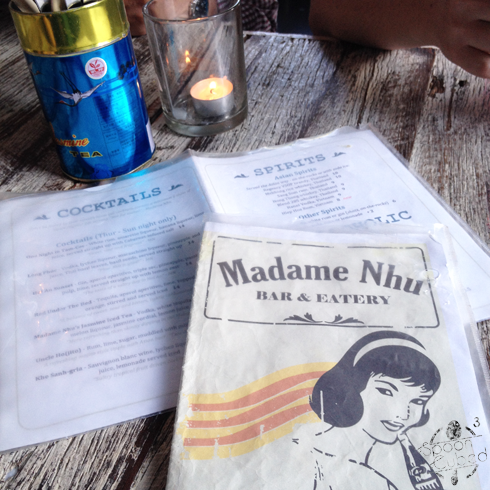 The drinks menu features Trung Nguyên coffee (a popular Vietnamese brand), an Uncle Ho Asian Beer Bucket, and cocktails with names like Khe Sanh-gria and Red Under The Bed. 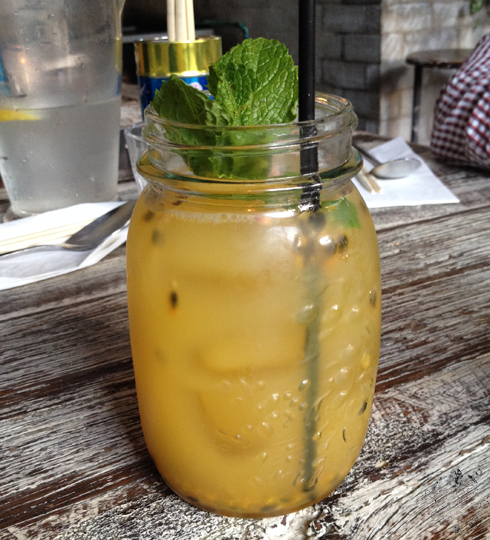 This mix of sweet pineapple and passionfruit juices taps into the good ol’ mason jar trend (which I don’t really mind). Passionfruit seeds float throughout the drink so it’s fun to try get them all with your straw without making a slurping noise. Minh describes this cocktail as “Phúc, this is good!” and I agree. When basil seeds are soaked in liquid, they become a little gelatinous so you get a floating layer of jelly-like seeds atop your drink. It’s a little sour and the alcohol means I can categorize this as “fun juice”. Heh. 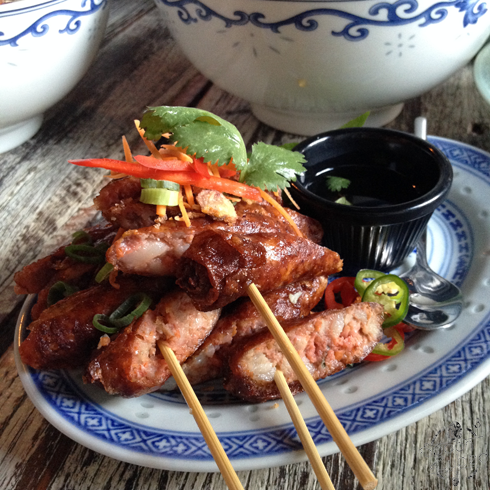 These pork sausages get a bite from the minced lemongrass, literally. There’s a slight crunch, and a little kick to the flavour. On the side of the plate is a small pot of nước chấm, a fish sauce based dipping sauce. I’m really quick to grab whatever pickled carrots there are on top of the pile because personally, I enjoy grilled/barbecued meat with copious amounts of it. As a kid, my favourite thing to eat at every family bbq was nem nướng. These taste like the ones from my childhood; a little fatty, soft, and yummy. Again, I grabbed all the pickled carrots and fried shallots because I love those things. Phở chua is literally sour phở and according to the menu, this one hails from Lạng Sơn province in northern Vietnam. I was surprised when these bowls came out as it wasn’t like the dish that I’m used to. 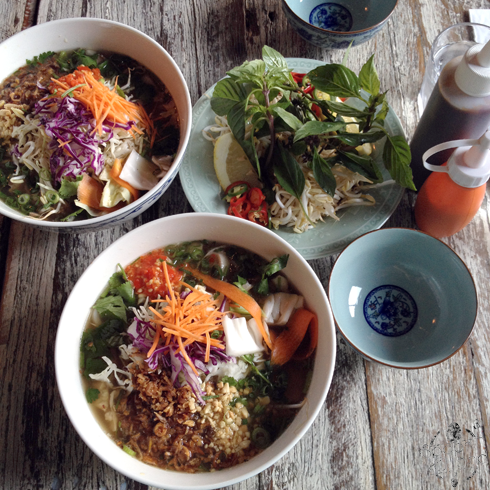 Each bowl is filled with a slightly sour broth, chopped herbs, chilis, pickles, fried shallots, and crushed peanuts. If it isn't sour enough for you, there's always the option of adding a squeeze of lemon. 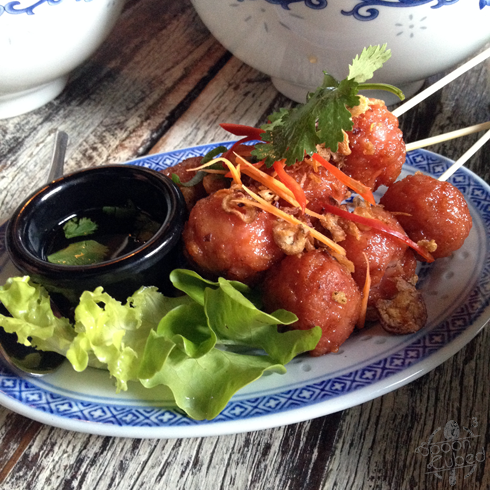 Madame Nhu is one of those places where you can meet some friends for a dinner that won’t break the bank. 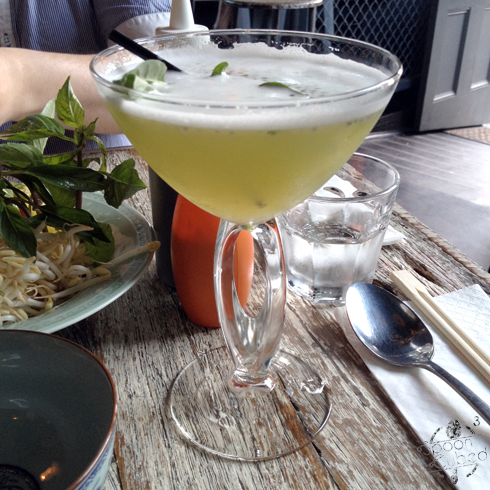 They do simple Vietnamese food in a trendy setting. If you plan to dine on a Friday or Saturday, you’d be best off getting there early to avoid the wait. Like the mural says: eat phở, drink beer (or cocktails). I'm Kim, enjoyer of food and occasional cook from Sydney, Australia. 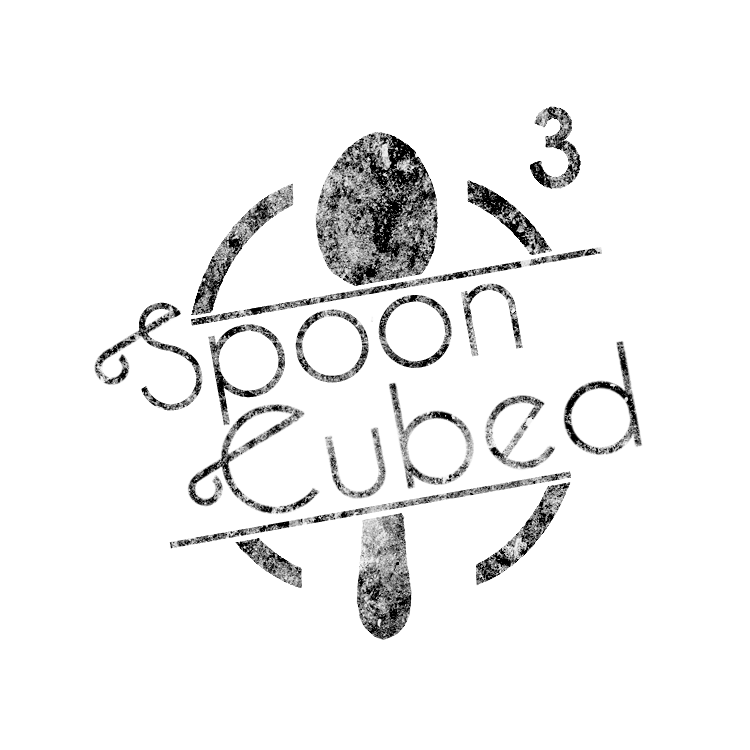 Welcome to spooncubed.